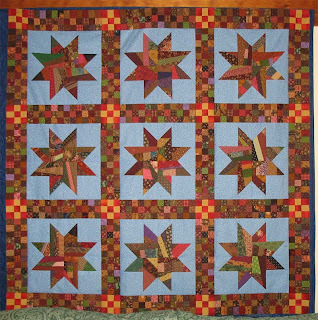 This is a quilt I made for my son about 15 years ago. 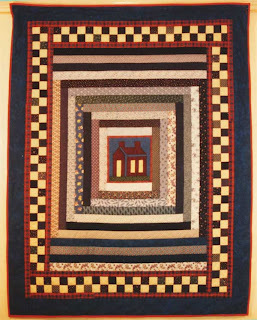 I had made a sample block for a house quilt, and didn't use the block in the final quilt. I added strips of blue fabric around the block till it was wide enough, and then added more top and bottom until it was the right size for the top of the mattress. The checkerboard border used up a heap of extra 4-patches from another project. It was super-quick to make and used up a lot of leftovers . I quilted it by machine, and it's still in good shape despite all the hard use it had. I had plans to make a similar quilt for my DD, using a floral applique block in the centre, but somehow it never happened. I may go through my orphan blocks and see if any of them lend themselves to the same treatment; it's such an easy way to arrive at a finished top. The other picture is of a Postage Stamp quilt that I made to showcase an English quilting design that I drew up for one of my books. It took more than two years to ha nd quilt using my floor frame, and despite my best efforts the summer sun faded the pink border fabric. The binding is the same fabric, but looks darker. One of the perils of quilting slowly in a climate with fierce summers. 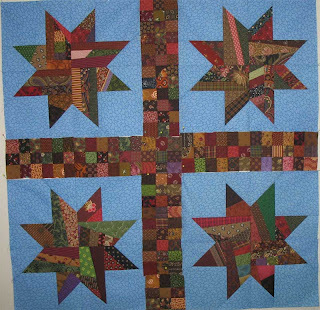 I have been sewing madly on the Maverick Stars, but I haven't made any progress that looks any different, just more stars and more pieced sashing and more incidental crumb blocks. They will both finish at the same time with a flourish I am sure, so all of a sudden I will have two tops, no more scraps and a clear work table. I can't wait. My Dad was manager of the Interior Decoratin g Department at a local department store, and every season he brought home the samples that had been discontinued. We had carpet and wallpaper books to play with, delicious pamphlets showing the outdated laminex fashions, and sample books of the new-fangled printed vinyl that you could use for shower curtains or tablecloths. 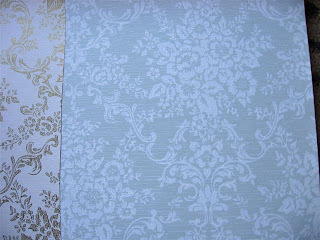 This was the age of embossed and flocked wallpaper, and enormous murals of Greek ruins and desert vistas. We adored these, and desperately wanted Dad to paper our walls with these emotive scenes, but they were too expensive. Our enterprising mother duly covered all our school exercise books with wallpaper and vinyl samples, and those patterns were ingrained into my subconscious over the years. I seem to have spent most of my time at school colouring in the designs on my book covers, mad with boredom at the lessons. I wonder if I developed my love of design from those patterns I studied so deeply, or if I just inherited it from my father. Hard to tell. I do know that the lessons left few memories, and the designs have stayed with me. Note the 3-D appearance on the back of the sample s. One of the ways I used to amuse myself was to see the leaf veins as popping out, and then try to see them as sinking down into the leaf. It takes a while, but suddenly it seems to change dimension, and you can't understand how you couldn't see it before. I have this ability to be able to imagine what a line drawing will look like as a3D object, which is really useful when I'm designing my quilting patterns; maybe I developed that knack from these dimensional wallpapers. Meredith, when photographing these books for my post, discovered that within the binding of them is a 2" piece of every sample that was left when Mum cut out the page. Deconstructing the book will let us see all those familiar and loved patterns again. We'll have to think about w hether we want to destroy what remains of the binding, not an easy decision. Incidentally, at the time I cried bitter tears because Mum wouldn't buy brown paper coverings for our books, like all my friends had. I must have been shallow. There has been some chat on Stashbuster about mixed quilting techniques, and I thought I would show you my very first proper machine free-motion stitched on a real quilt. I had made countless samples and practise pieces, but this is the first FM quilting that made it onto a quilt and stayed there. The body of the quilt is done by hand, the border by machine. 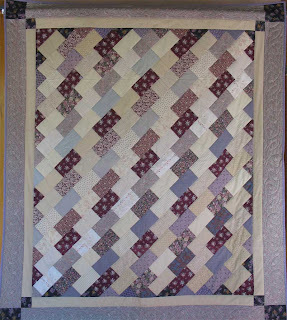 I made this quilt around 17 years ago, because I saw a picture of a similar one in a British quilting book and immediately saw how I could strip piece it quickly. My kids were 2 and 3 at the time, and I had very little quilting time; quick was good. Because the original quilt was Welsh, I named this Welsh Bricks. The colour scheme came from a description of a black and white photo of another old English quilt; rectangles of lavender and buff dress fabrics. I loved the sound of that, and made up my mind to use only those colours and variants in this quilt. The top took less than 2 days to make; the strip piecing worked perfectly. Hand-quilting was a different matter. I began quilting it that week, but i t was still not finished a year later, and I rashly promised it to a friend to hang in an exhibition. 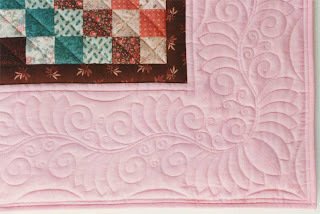 I still had no time, and I decided to throw tradition to the winds and finish the border with new-fangled machine quilting. tell me what I should and shouldn't have done. Number one would have been check the thread tension straight away. I knew to do this on my samples, but the stress of quilting a real quilt made it fly out of my head. The tension on the whole border is simply dreadful, as the close-up shows. Click on the pictur e to see it in awful detail. But I figured that no-one would be able to see it in the exhibition, and I would pull it out and re-do it later. I also did my first binding completely by machine on this quilt, and I like how it turned out, so I do all my quilts this way now. Once the quilt came back from the exhibition my DD claimed it for her bed, where it did sterling service for 10 years or so. Somehow I lost the urge to correct the quilting mistakes, and went on to bigger and better things. Oddly enough, there is not a broken stitch anywhere, in all that dreadful quilting. That became the basis for my philosophy of correcting mistakes. Live with it for a month; if it still bothers you, pull it out. It hasn't fixed itself, you can come back to it any time, if you still care enough. 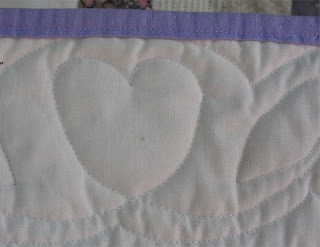 No-one in my family cared about the back of this quilt, just how warm and pretty it was. It still works as a quilt. And I could still fix it if I wanted, but I use it to reassure my students that their work will improve too, and that even their beginning efforts will be useful and appreciated. I struggled with the thread tension for years, and ended up modifying the foot that goes on my Janome and a lot of other machines. The top thread had insufficient tension, and was being dragged under by the bottom thread. I tied a piece of bias binding around the upright of the foot, beneath the spring, so that there was less downward pressure on the foot. 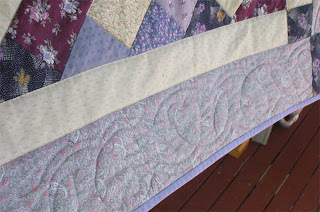 It meant I could move the quilt more smoothly, not dragging it along and reefing the thread through the tension discs. 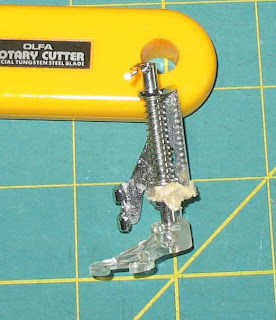 I know I can't prove anything, but I almost feel like the foot was keeping the needle bar slightly elevated, and releasing the tension discs. It was a cheap solution, and I've shown it to my students with the same good results. And the last photo today is the beginnings of my quest for herbal self-sufficiency. 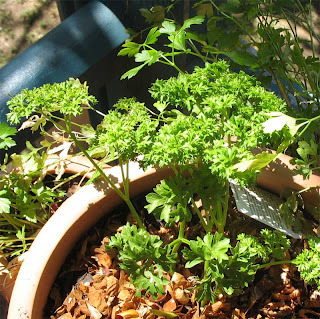 I have lots of parsley, Curled and Italian, dotted around the garden. 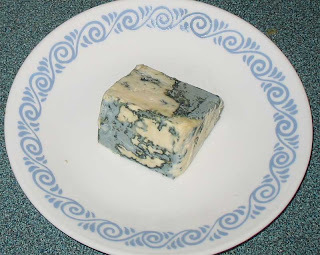 I adore parsley, when we go out to dinner I filch everyone's parsley garnish and eat that instead of dessert. It makes my heart glad to see my plants growing so happily; now to see if the grasshoppers leave any for me. I spent a lovely day in the garden, sewing seeds and repotting plants and planning a garden bed under two huge fiddlewood trees. It seems ages since I had time to work in the garden for as long as it needs, I've barely been able to keep things alive over the summer. But now that the beautiful autumn weather is here I am finding the time to potter around and put everything to rights. I usually over-extend myself with grandiose plans, so this year I'm concentrating on herbs and salad plants. I want to be self-sufficient in parsley, mint, shallots and simple salad plants like spinach and my new passion, Japanese Mizuna mustard greens. So lovely, I keep picking leaves to eat every time I go past the window-box where they are growing. I was working on my roses when I saw this fellow. He was so gorgeous I removed him for a photo shoot. 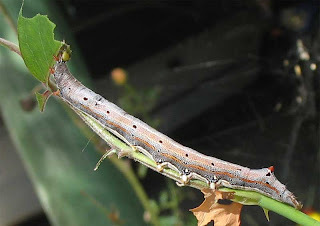 I don't approve of the way he is devouring my roses, but I know he will turn into a beautiful butterfly, and the world needs butterflies as well as roses. I could hardly believe the intricate detail of him, I could only see it when I had the photos in PhotoShop. 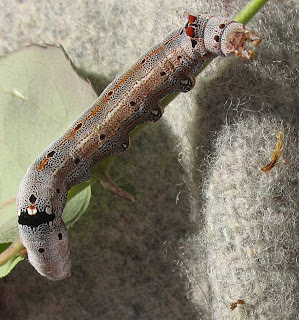 He's 4" long, and the black, cream and madder patterns of him mimic my favourite reproduction palette perfectly. Some of it even looks like stipple quilting patterns. His false face was fascinating. When I touched him he would bury his real head and his tail would rear up, with the red horns attracting attention and the dots exactly like eyes. Just an amazing defence mechanism. Still, lovely as he is, I hope he doesn't have too many brothers and sisters out there in the garden. 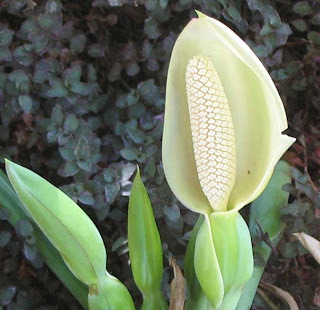 There are several interesting things flowering at the moment, but this is the strangest. It's some tropical thing, I may try and track down the name of it later. It's growing up the cedar tree, and laden with these strange flowers. Click on the picture to make it bigger and see the detail. It's incredible the way it all fits together. There is pattern and inspiration in everything around us. Caterpillars and flowers and wallpaper books and seed packets and tiled floors; it's good to be able to take parts of our ordinary lives and weave them into our patchwork. All the colours and shapes I see in my garden and my possessions contribute to the quilts I plan and design. It makes the creative process multi-dimensional, combining memories and symbols, favourite images and patterns. I gave myself a stern talking-to this morning. 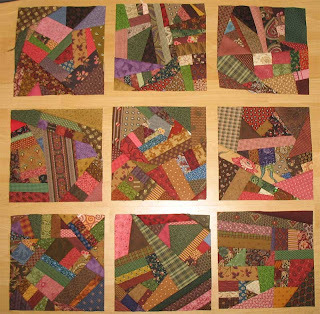 How could I call myself a Maverick Quilter if odd-shaped scraps made me queasy? What sort of free spirit could I be if I couldn't handle the sight of my table covered in fabric confetti? Was Order so important to me that it got in the way of creativity? How could I go on saving all these scraps if I was incapable of dealing with them? My hoarding of pieces then becomes a neurosis, not a virtue. I really thought I would enjoy this but it wasn't happening. I realised that I was feeling overwhelmed because I was actually sewing three things at once, with different techniques. I was foundation piecing the stars, crumb-piecing the tiny bits, strip-piecing the sashes and trying to do a leader-ender project as well. I had made no attempt to organise myself so that I could find the bits for each section. I had upended 5 containers of scraps and was burrowing through the mess and not enjoying it one bit. Small wonder! I needed Order so that I could create without interruption. So I packed away leader and ender pieces, to work on with my next quilt. Then I sorted the scraps into strips and squarish offcuts (henceforth referred to as wodges) and put away all the modern material that wouldn't fit in this particular quilt. That alone was a huge help. I've made a lot of the pieced sashing , so I put all those all aside to work on later. I gathered up all the stuff for the stars and put that in one spot. And because there was just soooo many small scraps I decided to make 9" blocks in a combination of crumb and crazy piecing to use it all up. I began sewing the wodges together, with no rhyme or reason. I picked up a bit, found something with a side that measured roughly the same and sewed them together. I did NOT at any stage use my judgement! I merely sewed. I did that for about an hour, then stopped and pressed all the little pairs. Then I repeated the same process to make bigger pieces. By this stage they were long enough to sew to strips, and trim the edges straight again. Behold, I was crumb-piecing!! When we were in high school we used to go to country dances, in wonderful old community halls. The old-style dances were a joy, and we loved memorising the steps and twirling around those well-worn floors with the country boys. The steps were a recipe for success, everyone doing the same thing, to the same music, and all the dancers part of the intricate pattern. Mum had been a wonderful dancer in her time, and the love of dancing was something we had in common. Once when watching an old movie we commented on the outrageous dancing some 1930's couple was doing. 'That!" snorted Mum derisively. "That's not dancing. That's jitterbugging." "Did you do that?" we asked, and Mum replied " I most certainly did not. I could have, but I didn't want to." Well it certainly looked like fun anyway. We have always doubted that Mum ever could have jitterbugged; she just couldn't let loose and go with the flow. She was all about control. She was all about following the steps and getting the right result. That's how she was, but it's not how I want to be. So today when I came to the conclusion that I was being too staid and conservative I threw caution to the winds and just went wherever the scraps led. And I had fun. I made blocks. How come I have to work so hard to do what comes naturally to people like Bonnie and Tonya? It's a mystery to me. I guess some people are born jitterbuggers, some people never want to do it, and some, like me, can learn if they try hard enough. I have collecting genes on both sides of the family. My maternal great-grandmother was renowned for never passing up the oppo rtunity to buy a yard of lace, and my (Scottish) paternal grandfather donated 2000 books on Robbie Burns to the National library. My Mum had a serious wool and fabric stash, and my father cherished wood and old furniture. 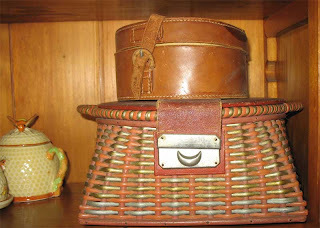 The photo is that same great-grandmother's sewing basket, with a leather box that once held celluloid collars belonging to my Scottish grandfather. Both inspired me to acquire other baskets and boxes over the years. I have collected lots of things, but always with limitations. Nothing cracked or chipped or broken. Nothing too easy to find; the hunt is most of the fun. Nothing popular and expensive. If the things I collect do become sought after, I stop collecting them, because I won't pay huge amounts for things I once picked up for a few dollars. It's that Scottish side coming out. As I have down-sized my possessions I've sold a lot of the things I once collected so happily, and I don't miss them at all. And I don't really collect anything now. We change as we get older, obviously. 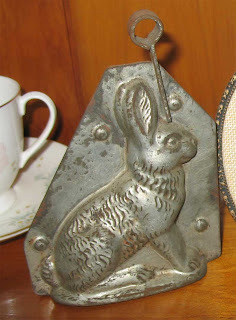 I did have a serious thing with moulds. Jelly moulds, shortbread moulds, cookie cutters, biscuit makers, ravioli presses, chocolate moulds. I love the idea of being able to replicate exact copies. I also love making things assembly line, lots and lots at a time. When the kids were little I got so carried away making their clothes one winter that there were 26 T-shirts to choose from in their cupboard. I make my own skirts and shirts in multiples of 5, and it seems to hardly take any more time. I would rather do three zips than one. Strange. Maybe that's why I adore patchwork too, because so much of it is sewing the same sort of units together, one after the other. It's an act of creative meditation, making clusters of things all to the same pattern. I was working in the garden on the weekend, and as I planted some seeds it occurred to me that they are the ultimate in replications. From when we were too young to read Meredith and I have been dazzled by the allure of seed packets. Plant these strange knobbled little lumps and they will all turn into nasturtiums, just like on the packet. Want a daisy, or purple beans, or carrots? Just buy the seeds and follow the instructions. Meredith still has the seed packets we pored over as 4 year olds, a beautiful little slice of the packaging of the time and the promise of good things to come. And as well as gardening I worked on the Maverick Stars, trying to decide on a setting. I am rather partial to this checkerboard of 1" squares, which is devouring the 1 1/2" strips in the container at a great rate. I may use a different block as a cornerstone, but I'll decide that later on. I just need to make some more stars. and get busy with those sashing strips. Soon I will have conquered my scraps and strings entirely!! Actually all I will have achieved is another quilt top, a lot of much smaller scraps and none of the blue fabric leftover. That seems to be the way of scrap piecing.